Add some kick to your game day party with this cheesy, spicy, and smoky Bacon Sriracha Queso. 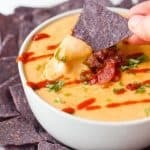 You’ll be shocked how easy queso is to make at home! Cook the bacon in a medium-sized sauce pan over medium high heat until crisp. Remove the bacon with a slotted spoon to a plate, leaving the bacon grease in the pan. Add in the onion and garlic, and cook until fragrant and tender, about five minutes. Sprinkle the flour over top of the onion and garlic, and stir. Cook for 2-3 minutes, or until the flour just begins to darken. You can use whatever (unsweetened, unflavored) kind of milk you like. I like to use almond milk, because the nutty flavor is a really nice background to the queso!